Do you have a large library of resources available for your website visitors, but are unsure how to offer the most relevant resource at the right time? In this case study, discover how Flywheel laser-focused engagement with their vast library of guides and courses using OptinMonster’s page-level targeting. Flywheel is a managed WordPress hosting company. It started in 2012 with a simple mission: to improve the lives of the millions of web designers and developers worldwide that build sites on WordPress. Brittany Pollock, the Content Coordinator for Flywheel, chatted with us about how they’re using OptinMonster to share targeted campaigns to their readers. Flywheel primarily uses OptinMonster on their blog, Layout, to increase subscribers and optimize lead generation. Most of Flywheel’s optins are used to drive traffic to landing pages where users can opt-in to various lead magnets. A lead magnet is anything of value offered in exchange for an email address. Common examples include ebooks, courses, coupons, and free trials. They do this using our powerful page-level targeting which allows you to choose specific pages on your website where each campaign should display. 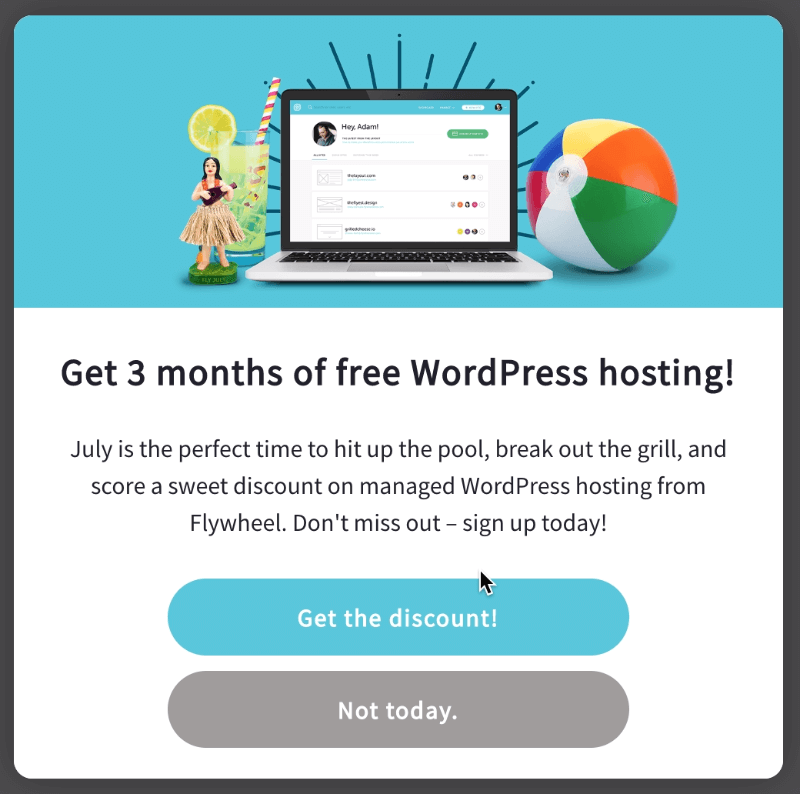 For example, for visitors reading articles in the Design Inspiration category, Flywheel shows a campaign offering an email course on design trends. When the visitor clicks, “Sign Me Up” in the lightbox optin, they are directed to the Design Trends course landing page. This lightbox campaign displays after the visitor has been on the site at least three seconds and converts almost 1.5% of visitors reading articles in the Design Inspiration category. On some pages within the category, it converts as high as 4.8%. If the reader is viewing an article in the Business category, they might see an optin that promotes an ebook about making more money, like the one below. This lightbox campaign also appears after the reader has been on the page for at least three seconds. 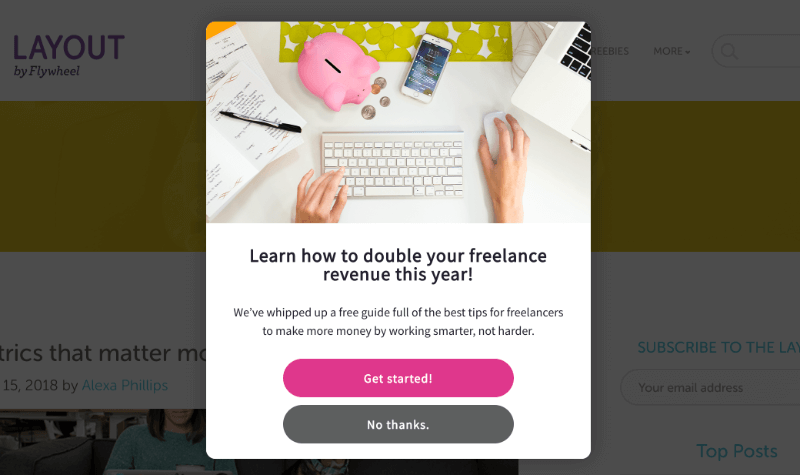 When the visitor clicks the “Get started!” button, they are redirected to the landing page for an email course about increasing freelance revenue. 4.7% of visitors click the yes button in this campaign, driving huge amounts of traffic to the email course. Flywheel has done a great job of targeting specific lead magnets like this to the content on their site. However, they didn’t just magically know that this email course would convert well when shown in the Business category. In fact, they didn’t start out with this offer at all. This campaign converted 3.74% of visitors. A solid result, for sure, but after using OptinMonster’s built-in split-testing, they found the offer for the email course converted even better. OptinMonster’s A/B Testing lets you split test your campaigns so you know what’s working for your customers. With the click of a button, you can create a split test and try different content, headlines, layouts, styles, and campaign triggers to see what converts best. Our biggest takeaway from using OptinMonster is to always try new things and run split tests. It’s a great way to determine what content will resonate best with your site visitors, and it’s a refreshing change for your repeat visitors as well. Other OptinMonster users have had similar success with page-level targeting. For example, FitSmallBusiness converted 40% of readers using page-level targeting to make offers specific to the content a reader was viewing! Flywheel used OptinMonster to target offers to readers based on the content they were reading at the time and saw conversions increase as a result. Flywheel converted 4.7% of visitors using page level targeting. Flywheel increased conversions almost 1% using split-testing. Flywheel attributed a 660% increase in offer impressions on their website to their OptinMonster campaigns. Pay attention to the interests of your readers by targeting your resources and offers to appear only on the content most relevant to that offer. OptinMonster is a great marketing funnel tool for every online business. In the first month alone, we tracked over 5,000 impressions on our site powered by OptinMonster, and it soared to over 38,000 the month after that. Our best campaign has over 157,000 impressions.